For glamour or boudoir photography, whether I’m photographing in a home, apartment, location or studio, one of my most go-to environments will be a bed. A female draped across a bed is the epitome of glamour or boudoir imagery. I thought I’d take this opportunity to share some photographs from a recent shoot with professional model Amber, and also to demonstrate several different ways of having your subject posing on a bed. Note that I prefer to have neutral bedding, for example white or cream, where possible so that the colour of the bedding doesn’t distract from the model. 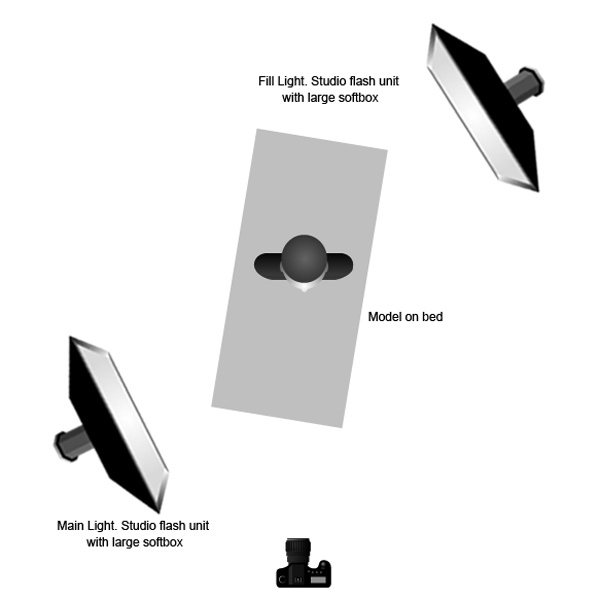 If your bed is positioned near to a window you can use the natural light if there’s enough of it, otherwise, it’s useful to have some flash lighting handy. Here, I used two studio flash heads in a two-point ‘sandwich lighting’ setup (see lighting diagram below). I hope the photographs give you some inspiration. Click the images to see them bigger and feel free to post a comment below. Thanks. I love the simple colour palette and the clean, crisp lighting. Great model too – she would be good for close-up beauty portraits. Very well done series.